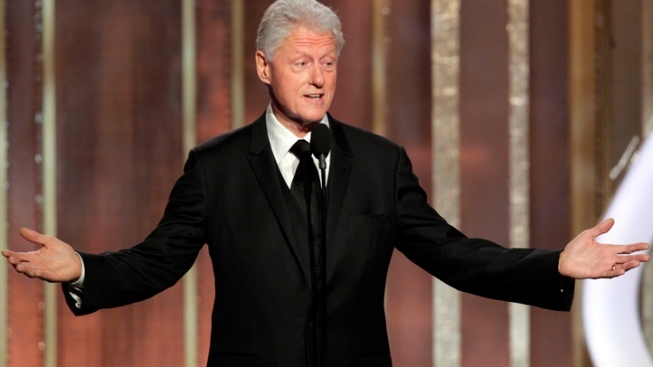 This image released by NBC shows former President Bill Clinton introducing best picture nominee "Lincoln" during the 70th Annual Golden Globe Awards at the Beverly Hilton Hotel on Jan. 13, 2013, in Beverly Hills, Calif.
Just when you thought GLAAD couldn't top Madonna's appearance at its Media Awards in New York City, along comes former president Bill Clinton. The gay media watchdog group announced today that the former commander in chief will be honored at the Media Awards in L.A. on April 20. Clinton will receive GLAAD's first Advocate for Change Award. "President Clinton's support of the LGBT community and recognition that DOMA, the so-called Defense of Marriage Act, is unconstitutional and should be struck down shows that the political landscape continues to change in favor of LGBT equality," GLAAD's Wilson Cruz said in a statement. "Leaders and allies like President Clinton are critical to moving our march for equality forward." Ryan Gosling hits the red carpet in New York City for the premiere of their new film, "The Place Beyond the Pines." This year's presenters list includes A-listers Leonardo DiCaprio, Charlize Theron and Jennifer Lawrence. Also being honored is openly gay entertainment lawyer Steve Warren with the Stephen F. Kolzak Award. "Steve Warren's work and career have opened doors for out professionals across the entertainment industry," Cruz said. "In addition to advocating for LGBT people, he has continuously mobilized a large base of high-profile allies to help bring about social change." The awards will be handed out at the JW Marriott in downtown Los Angeles.